Isolated Rains in Tamil Nadu has been continuing for the last couple of days as the effects of Cyclone Vardah lingers around in the region. Last night saw parts of Chennai and surrounding areas get spells of light rains under the effect of moisture drag. The remnants of Cyclone Vardah now linger as a low pressure in Arabian Sea near the Lakshadweep Islands. Thanks to this low level moisture is getting dragged across Peninsular India creating isolated rains in Tamil Nadu. This is partly aided by the wind confluence as well between the Easterlies and dry Continental air from the North. 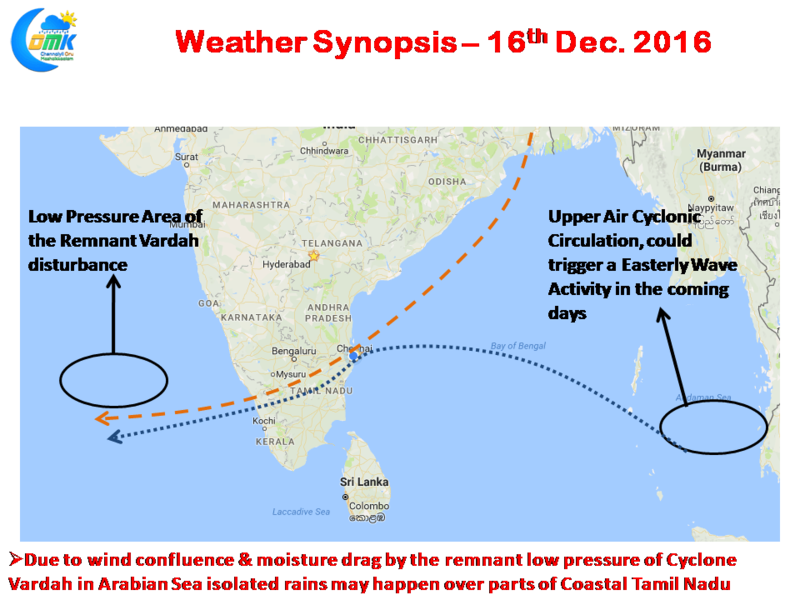 As indicated in the charts while the remnants of Cyclone Vardah lie as a low pressure in Arabian Sea, an upper air cyclonic circulation now persists over the Gulf of Siam Region that is likely to trigger a tropical wave activity in the days to come. Currently models do not expect any major development arising out of this though we could see some rains in Tamil Nadu around 18th / 19th under the influence of this Easterly Wave.